The Risks and Benefits of Daily Calcium Supplementation. Is taking calcium every day dangerous? For most people, taking calcium pills every day for bone health is safe. But there are certain circumstances that may make daily calcium supplements inappropriate or even increase your risk for cardiovascular disease. Over the last few years, you may have seen reports warning of the risks associated with taking daily calcium supplements. While it’s true that there are risks, there are also benefits, just like for any supplement or medication. In this article, we’ll assess the risks of taking calcium daily for many years, and give a practical approach to calcium supplementation. Women are Supposed to Take Daily Calcium… Right? Women have been told for generations that they should take calcium pills daily for their bones. It has been known for many years that post-menopausal women are prone to developing osteoporosis and therefore, taking calcium every day was presumed to help prevent this bone thinning. But as it turns out, it is considerably more complex than just taking a few calcium pills every day, and for most people, those calcium pills will not help. For instance, we know that exercise is extremely important to bone health in post-menopausal women. We also know that other elements such as magnesium play a considerable role in bone health. Parathyroid function may be the biggest factor that is overlooked. Parathyroid glands control the amount of calcium in the blood and in the bones, and as many as 2% of women will have problems with their parathyroid glands, and therefore, problems with the amount of calcium in the blood or bones. Parathyroid problems are common in adults, and are three times more common in women. In fact the highest incidence of parathyroid problems and hyperparathyroidism occurs in post-menopausal women. All women who are considering taking calcium for their bones must know their blood calcium level as well as their parathyroid hormone (PTH) level. If a person (man or woman) has blood calcium that is elevated even a little bit, then they can be presumed to have a problem with one of their parathyroid glands. As it turns out, the extra calcium in the blood is actually coming from the bones! If this is the problem, then taking calcium will not help, and can even make things worse. Treating the parathyroid disease by removing the parathyroid tumor is the only way to help the bones in this scenario. Read more about hyperparathyroidism. After parathyroid surgery, we start everyone on daily calcium and Vitamin D supplements. The reason is straightforward: when you have a parathyroid tumor, it makes a hormone (PTH) that leaches calcium from the bones and puts it into the blood. Once that tumor is out, your bones start pulling calcium in again and the calcium in your blood will drop as the calcium enters the bone. Since your body relies on a steady calcium level in the blood, you need to replace that calcium. More about this here. Every supplement, including calcium, has potential risks. Some people are wary of taking calcium supplements, as several studies over the last few years show potential harm in them if taken without guidance. Specifically, there is concern that calcium supplements cause cardiovascular events, such as heart attacks and strokes. Researchers have performed long-term studies comparing adults who take calcium supplements to those who do not. These studies have found mixed, and sometimes contradictory, results. Some studies show that calcium supplementation has no effect on the incidence of heart attack, stroke, or death. Others show that heart attacks and strokes occur more often in those on calcium supplements. Some show a harm for men but not women. Is Taking Daily Calcium Safe? When evaluated overall, it can be difficult to pin down exactly how harmful calcium supplements are. In general, though, it does appear that there is a small risk in taking long-term calcium supplements. [i] Most people who take calcium supplements will likely have no harmful effects from it, but a few people will put themselves at higher risk of a heart attack or stroke. Of note, this does not apply to dietary calcium – the calcium you get from food like dairy products and leafy green vegetables. The risks are only associated with supplemental calcium. As stated above, you should always know your blood calcium levels and if they are even a little bit high you should be tested for hyperparathyroidism and should avoid calcium. So Why Put All Parathyroid Patients on Calcium After Parathyroid Surgery, if There are Risks? If there are risks to daily calcium, why put your parathyroid patients on calcium? The best way to think about this is to treat any vitamin or supplement as a medication. Every medication has side effects, but if the benefits outweigh the risks, we take the medication. Calcium supplements are an absolute necessary medication after parathyroid surgery, because your body is adjusting to new parathyroid hormone and calcium levels, and your bones need the calcium. People who undergo parathyroid surgery have had a parathyroid tumor (or two) taking calcium out of their bones for many years. There is a very clear benefit to calcium supplements to these patients- which far outweighs the small risk. Long-term, supplements may help with osteoporosis – but again, this is treating them like a medication for osteoporosis. Vitamin D and magnesium should also be thought of as medications for osteoporosis. Important note: While calcium supplements can be used as a treatment for bone loss, they are not effective in preventing bone loss, except in those with very low dietary calcium intake. Adults with normal bone density and normal blood calcium levels gain little from taking calcium supplements. Since there is a small risk of taking the supplements, the risks outweigh the (near zero) benefit, and thus calcium supplements are not indicated. Most adults do not need to take calcium supplements. Everyone should strive for a balanced diet that includes calcium-rich foods, including leafy green vegetables and dairy products. With this alone, most people will maintain the correct calcium levels. Who should take daily calcium? Some people need to be on calcium supplements. If you are in one of the categories below, then you should take calcium supplements, as their benefit outweighs the risks. Those with osteoporosis and increased bone fracture risk. Calcium, Vitamin D, and magnesium supplements are necessary for rebuilding bone. If you are on a bisphosphonate or other prescription medication for osteoporosis, then you should also be taking calcium, magnesium, and Vitamin D supplements, as these are necessary for strengthening bones. You should also attempt to get a calcium-rich diet. Anyone who just had parathyroid surgery. In parathyroid disease, the blood calcium levels are generally above normal (above 10.0 mg/dl in adults over age 40) (2.5 mml/l for Canada and Europe) because of a parathyroid tumor that makes PTH. Once that tumor comes out, the PTH level drops immediately, and the blood calcium level drops soon after. The bones take up a lot of that calcium, which then needs to be replaced. At the Norman Parathyroid Center, we put everyone on calcium and Vitamin D supplements as soon as the operation is over – we give it in the recovery room! If you don’t take calcium after your parathyroid operation, you are at a high risk of getting low blood calcium within a few days after the operation. This sudden shift in calcium can lead to numbness and tingling in the hands and face, progressing to muscle cramps, then tetany, with muscle spasms and convulsions, seizures, and cardiac arrhythmias. This is all prevented by taking calcium after the operation. The risk of having low calcium after parathyroid surgery is highest in the first few weeks after the operation, and everyone should be on calcium during that time. How much daily calcium do you need? Everyone needs some calcium every day. Multiple organ systems in your body depend on a steady supply of this essential mineral. For most adults, adequate amounts can be obtained from diet. [ii] The World Health Organization recommends getting 500 mg daily. [iii] More is required for those with osteoporosis or intestinal malabsorption as noted above. 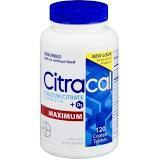 For the first week after surgery: 5 Citracal Max pills daily. 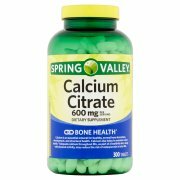 This amounts to 1,575 mg of calcium citrate and 1,250 units of Vitamin D daily. For the second week after surgery: 3 Citracal Max pills daily. This is 945 mg of calcium citrate and 750 units Vitamin D.
Beyond two weeks following surgery: 2 Citracal Max pills daily. This is 630 mg calcium citrate and 500 units Vitamin D.
We increase this amount sometimes to 6 or even 8 pills per day for the very first day for people who have very large parathyroid tumors for many years and who have very bad osteoporosis. After their first month of high calcium listed above, we recommend continuing calcium and Vitamin D for six months for adults with normal bone density and a regular diet. These people can stop taking calcium at that time. For those with osteoporosis or malabsorption issues, we recommend staying on the supplements long-term. For those with a permanent malabsorption of calcium, as occurs after a gastric bypass, lifelong calcium supplementation will be necessary. For postoperative patients with osteoporosis, we advise supplementing with calcium, magnesium, and Vitamin D. Ideally, much of the calcium will be obtained through a calcium-rich diet (dairy products, but also leafy green vegetables), but we also recommend taking around 600 mg of calcium supplements. We also start patients on 400 mg daily of magnesium, another essential mineral for bones. Since Vitamin D aids in calcium absorption, we recommend taking around 2000 units of Vitamin D daily. As always, this is something you should be discussing with the doctor that is following the osteoporosis for you. For those with osteopenia, we recommend getting a calcium-rich diet and taking Vitamin D supplements (1000 to 2000 units daily). Calcium supplements will need to be taken postoperatively, as with all parathyroid patients, but these can be stopped after 6 months unless your doctor advises differently. There are risks to taking calcium supplements – just like there are risks with every medication and supplement. We need calcium, but most or all of it can be obtained from a healthy diet. For those with osteoporosis or an intestinal problem with absorbing calcium, long-term calcium supplements are recommended, as the benefit outweighs the risk. Finally, after a parathyroid operation, everyone needs to take calcium for at least 6 months. [ii] Just to make things more confusing, the definition of adequate varies by country. In the United States, the Institute of Medicine recommends 1000 mg a day for most adults, and 1200 mg daily for women over age 50. Other countries have lower requirements: the U.K. recommends 700 mg daily, and the World Health Organization recommends getting 500 mg daily. The current U.S. recommendations may be too high, especially given the growing evidence that excess calcium supplementation can increase the risk of heart attack and stroke.